James McNeill Whistler was one of the most controversial American artists of his time. He added new and restored old dimensions to nineteenth century painting. He was also a witty and caustic writer. He is probably best known for the painting Portrait of My Mother which hangs in the Louvre in Paris. 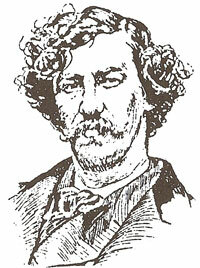 ■ Whistler was born in Lowell, Massachusetts, July 10, 1834. His grandfather, John Whistler, was a Scottish major in the British Army under General Burgoyne. He settled in America after the Revolutionary War. His mother, Anna McNeill, was also descended from early Scottish settlers. ■ Whistler spent his boyhood in St. Petersburg, Russia, where his father was a railroad engineer. When James was 15, his father died and the family returned to the U.S. He attended West Point Military Academy but left in his third year. In 1855 he left the U.S. for Europe and never returned. He studied in Paris and later was honored by many European art societies. ■ However, as an artist Whistler was not widely appreciated in his early years. His originality brought strong criticism. His portraits had a ghostly style and some of his paintings were somewhat abstract by 19th century standards. ■ He produced more than 400 etchings which some critics have classed with those of Rembrandt. Examples are found in the art galleries of London, Paris, New York and Venice. He also produced some remarkable watercolors and pastel paintings. ■ Whistler is said to have imposed himself on his age because of his dissatisfaction with the clutter and detail of conventional painting. He engaged in disputatious writing about the taste of his critics. When John Ruskin ridiculed Whistler's abstract art, Whistler sued and won. He died in Chelsea, England, on July 17, 1903.